The Robertson Trust is remembered on Commemoration Day for its generosity in supporting important projects at the University. 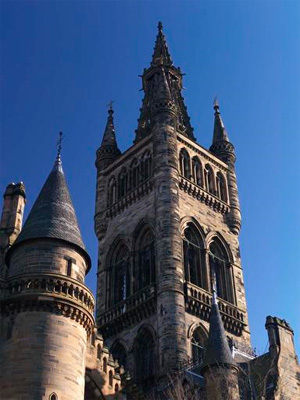 It has contributed millions of pounds to the development of the University, including the endowment of the Robertson Chair of Biotechnology, founded in 1988; funding for the construction and equipment of the Robertson Institute of Biotechnology which opened in 1992; the Drug Outcome Research in Scotland (DORIS) Study at the Centre for Drug Misuse Research (which began in 2000) and the CRUK Beatson Cancer Research facility at Garscube (2004-05). The Trust made a significant contribution to the appeal for the Glasgow Biomedical Research Centre, which opened in 2006. Since 1995, it has contributed thousands of pounds to the Weipers Centre for Equine Welfare. When James Robertson died in 1944, he left his whisky blending and broking business to his three daughters. Elspeth and Agnes Robertson elected their sister Ethel (known as Babs) to represent them in business matters, but she acted in all things with their agreement. In 1961, the sisters set up a holding company and a charitable trust, to preserve the independence of the family businesses (Robertson & Baxter and the Clyde Bonding Co) and to continue and extend support that the family had given to various charities. The sisters� interests in the family companies were transferred during the early 1960s to a holding company, named Edrington (for one of the family�s farms), and the shares in Edrington that were given in exchange were in turn gifted to a new charitable trust, the Robertson Trust. The Robertson Trust held all voting shares in Edrington. The three sisters were among the seven original trustees, whose broad remit was to "make payments out of revenue of sums for such charitable purposes as the Trustees may� determine, and for such charitable purposes only." The Trust has supported a wide range of charities in the fields of Care, Health, Education and Training and Community Art and Sport.